It's true, some of us might have wondered what the U.S. would look like if it was split in half and according to the United States Geological Survey we may actually find out. It's not enough that our country is already split in half politically and now there's a concern about our country literally splitting in half! Even though the New Madrid fault zone has been in the news for quite some time, here's some information about it to refresh our memory. As we know the U.S. has a lot of fault lines that lie underneath its surface. The most well known is the San Andres Fault. 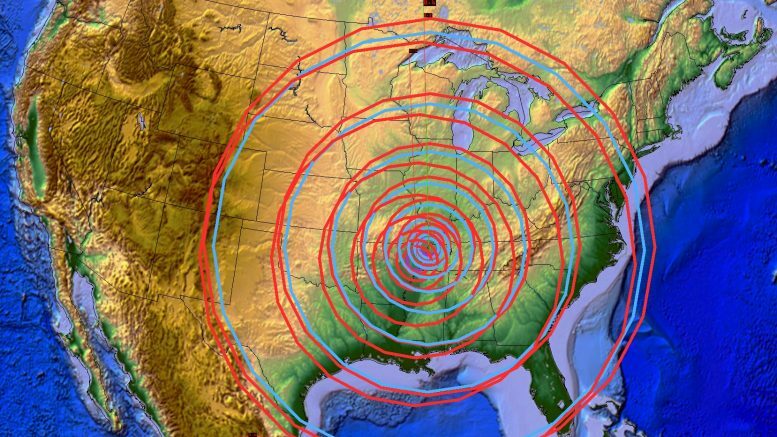 Even though the San Andres fault is closely observed, another one specialists are now keeping a close eye on (and rightfully so), is the New Madrid fault. It makes sense they're keeping a close eye on this fault because it's six times larger than the San Andreas fault and it covers a large portion of Illinois, Indiana, Missouri, Arkansas, Kentucky, Tennessee, and Mississippi. Yikes! To find out what would happen and who would be the most impacted by a rupture on this fault line, head to the next page. This is just another reminder to be packed and ready to leave the area (if it's safe to do so), during a survival scenario! Stupid ad keeps covering the 2nd page. It will certainly make a really, really big Mississippi. More worried about Yellowstone, honestly. If it could just rip California off and throw it beneath the ocean that would be great. Yep, heres the deal people.. The fault erupts every 200 yr.s… Its way past due. Last time it was late the mississippi ran backwards. Now the scientists are predicting, it she quask it will be the largest ever and will be felt on the east coast causing a major disaster for all of the usa as it will cut off supples to the rest of the usa, roads, railways, shipping lanes destroyed. Got the picture. Awesome! Now I can put some anti-earthquake supplies in my bug-out bag! I’m starting to get to the point I want to unfollow this page. About 90% of the articles are conspiracy theory sensationalism that disregard all current scientific research as flimsy justification for survival prep. Right in half huh? Perfect, liberals can have their own half of a country and the rest of us can have our freedom. I’m actually ok with the new map. Now you’re starting to go down the tinfoil hat rabbit hole. Southern Cali. Northern is a red state. No it won’t and people should not believe this nonsense fear mongering. Go study geology. Absolute garbage. No one can possibly say this is fully truthful, fault line I know runs through California, they may have issues there, but hey, they can’t abide by federal laws,$#%&[email protected]*happens. You don’t have to wait for Mother Nature. Hell you could even separate yourself from the human race. Yeah, by mouth breathing troglodytes that are afraid of everything. Oh STEP THE HELL BACK PEOPLE ! Quite enough OF THE SKY IS FALLING HORSE$#%&[email protected]*FROM MSM , we don’t need more SPECULATION OF FOOKING DOOM ! Should be on Arizona state line. Yep in 50 million years better start prep now.